You’ve optimized your product photos. You’ve written $ 300 descriptions. You’ve taken all the right steps to improve conversion rates on your product pages, but there’s still more to be done. Let’s take a closer look at five more ways that you can improve consumer confidence, increase brand loyalty and keep those conversion numbers climbing on your product pages. Product Thumbnails: Do They Help or Hurt the Process? A Nielsen Norman Group study took a look at the use of photos as the primary driver of consuming web content. The question was, Do product thumbnails really help? The answer is: It depends on what you’re selling. Notice how much attention was given to the images of bookcases on the Pottery Barn website versus flat screen TVs on Amazon.com. A flat screen TV thumbnail doesn’t tell you nearly as much about the product as the text below it. 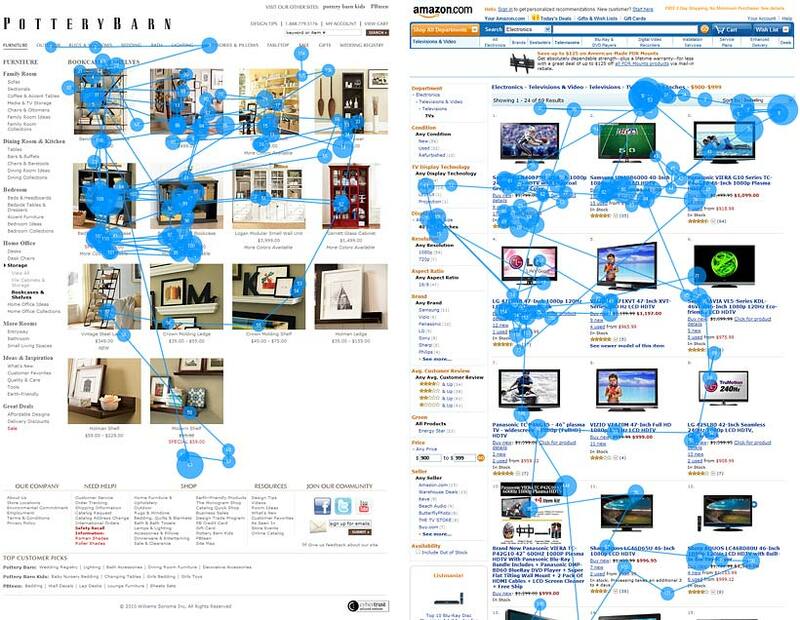 Of course, this is Amazon and they lay out all their product categories in a similar way, but only 18% of the time viewers spent on the page was used to view photos, while a whopping 82% of their attention was devoted to text. All TVs look pretty much the same in your living room, and you can’t very well estimate image clarity just by scrolling through the different models. Conversely, notice how much attention was given to the bookcases. This type of interior décor is just as much about quality and craftsmanship as it is looks and style, so being able to preview thumbnails for color, size and so forth is an important step in the buying process. Large Images: Fluff and Filler or Decision Clincher? While we’re on the topic of images, many product page optimization tips will include some reference to using large images. While this is a well-meaning suggestion, it can ultimately do more harm than good. 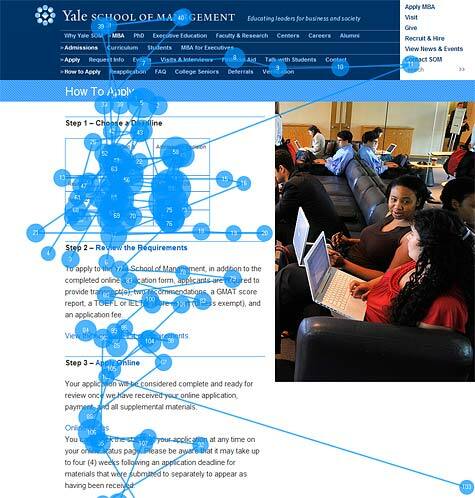 The same study references a page from Yale University, which incorporated a stock image of students to help add a bit of color to its application page. But as you can see from the eye-tracking results, nobody cared. It’s a simple stock image, and stock images have gone the way of banner ads, generating yawns rather than attention and focus. In the interest of conserving bandwidth, most users who want to see an enlarged photo are greeted with a version that is, at most, 20% bigger, when it needs to be at least 50% to allow them to see details — and it’s even better if they can easily zoom in. But it’s a good idea to approach images from your customer’s point of view. InternetRetailer reported that DueMaternity realized their customers want to see every angle of an outfit before buying. So they adopted a 360-degree view of some products — resulting in a 27% conversion rate increase. Of course, you’re going to be in for an uphill battle if Amazon is your biggest competitor. But there are other ways to compete on price without breaking the bank. Even if you can’t win on price, you can still win on other tangible and intangible factors, including value, service, quality and selection. Jessops.com does a great job of bringing community to their product pages. Buying a DSLR camera is a big purchasing decision for many aspiring photographers, so knowing what they’re actually getting is extremely important to them. 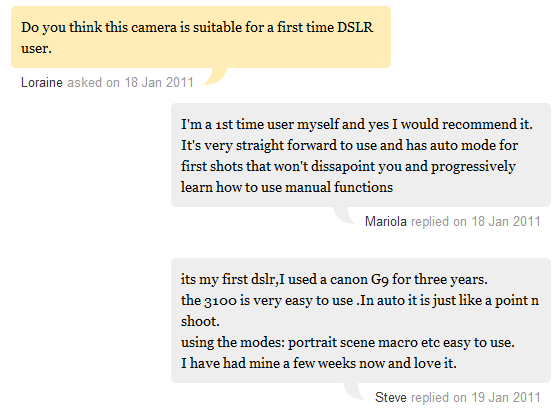 Jessops included a Q&A feature on their product pages, allowing previous buyers to respond. This not only created a strong sense of community, it may also have given the site an edge in their search engine ranking, since this content is loaded with relevant long-tail keywords. Amazon does this as well, although its Q&A currently seems more like an afterthought pinned on at the bottom of the page rather than a keen focus on giving customers the information they’re looking for. Incorporating a feature like this, particularly for high-end products, gives customers an opportunity to share their experiences on your pages without directly leaving a review, increasing the chances that others will ask questions and provide answers. Even if you find shooting, producing, editing and uploading a video intimidating, you can still get professional results with very little experience. Vimeo has a Video 101 class that walks you through the entire process, so you have no reason not to get started. Bonus Tip: What About Inventory Issues? If you know you won’t have any more in stock any time soon, or if you’re selling seasonal products, you can use a simple 301 redirect which will let you change a URL to something more relevant without losing any of that built-up search engine goodness. By incorporating these types of features and benefits into your product pages, you’re not only greatly increasing the relevancy of your product to the customer, but you’re also showing that you’re willing to go the extra mile to ensure their complete satisfaction with your overall shopping experience. And, of course, creating a terrific user experience is one of the best ways to raise your conversion rates. Have you used any of these methods on your own site? How has it affected your conversion rate? Tell us in the comments below! The post 5 More Ways to Make Your Product Pages Sell appeared first on The Daily Egg.